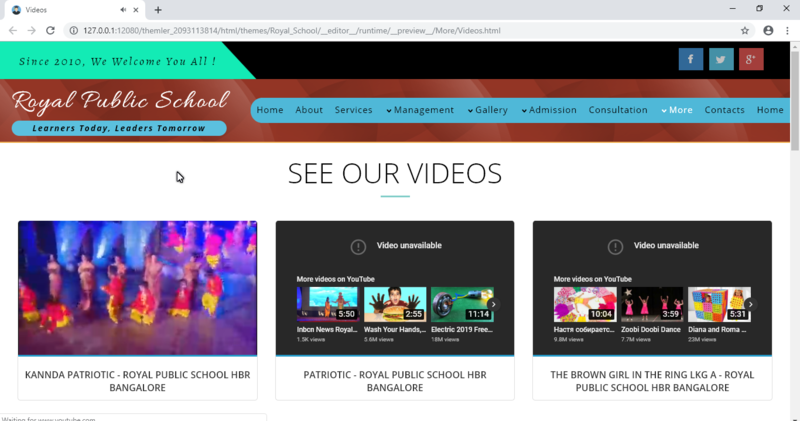 We are added YouTube Control in our HTML Website Page (Video.html) while at the time of clicking the video play button it shows one error message as - Video Unavailable. Why? The same vide is playing successfully from a direct link or from YouTube in Browser but from our Themler Project, it is not. What will be the error please fix this ASAP and share the solutions to us. Ex[ecting your quick response, we are unable to process our work due to this issue. Screenshot of the error message is attached here. Any updates on this please ??? Consider this as important and provide the fixes ASAP. Note: Is your support team reply only for the payed support or for general users too they will take care of reply the support tickets ? I am wondering why your team is not replying my tickets. hello. Need your reply on this one please ? I apologize for the delay and am very sorry we caused troubles for your project. And it works fine on my end. Could you please try this link instead and let us know if it works for you? I have got it from the "embed" option in youtube.